Larne Tech Old Boys’ memorable weekend featured a win which left the club in dreamland off a performance grounded in the reality of hard yards. 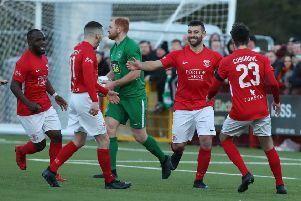 Home boss Johnny Hastings enjoyed the acclaim off the back of a 3-1 defeat of Strabane Athletic that put the Amateur League club in the Irish Cup quarter-final draw but proved quick to highlight the blueprint behind the red-letter day. Larne Tech Old Boys finished in the quarter-final draw on Saturday following victory over Strabane Athletic at Dennis Harvey Park. Pic by Pacemaker. “Even if we could never imagine at the start of the season this club would be sitting in the quarter-final draw of the Irish Cup, it was a performance I know the boys are more than capable of producing,” said Hastings, who is now in his sixth season as first-team boss and ninth overall in Larne Tech OB colours. “We had done our homework on Strabane Athletic but working hard and pressing high is a big part of how we always play. “We have guys who will run all day and are willing to put in that work, so it was not an unexpected performance. “More than nerves, leading up to the game it was a case of a great buzz around the club and to have the majority of the squad involved was a real bonus too. “Although Strabane had three players sent off and we had our own red card, it was far from a nasty game and probably only really had one bad tackle. Craig Todd chasing down Strabane Athletic's Kyle Harte. Pic by Pacemaker. Paul Maguire kicked off the scoring on 10 minutes then hit the post before Craig Todd reacted to net the rebound and double the home advantage. An altercation led to the dismissal of both Scott Todd and Strabane’s Kyle Harte but Larne Tech regrouped to cement control with a second of the afternoon for Todd. Aaron Patterson cut the gap for Strabane but the final whistle sparked home celebrations at Dennis Harvey Park. Dylan Forbes and Luke McGeehan also suffered red cards before the close of play. “We have players with senior experience and our goalkeeper, Chris Keenan, won the Irish Cup in the past at Crusaders, so that helps,” said Hastings. “It’s a great group of players as even those who have been at that higher level still remain keen to listen and are willing to learn. “The first goal in any game helpes to settle those nerves and Paul puts away any half-chance that comes his way. “We asked Sean Ward to keep on delivering from out wide and it was just a great contribution from everyone on the pitch and off it to get us into the quarter-finals. 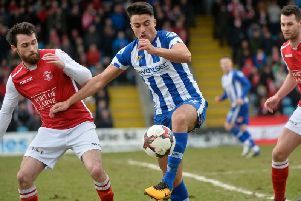 Although a quarter-final date now awaits in March against either Danske Bank Premiership-based Warrenpoint Town or Queen’s University of the Bluefin Sport Premier Intermediate League, Hastings is determined to maintain momentum by staying sharp. “We will not lose our focus by thinking too much about the Irish Cup quarter-finals down the line,” said Hastings. “We have a big game away in the Clarence Cup at Immaculata then a massive league match. “If we finish the season without promotion out of Division 1A then I’m going to end up disappointed and we currently sit second behind Killyleagh with quite a few games in hand.